We just faced a beastly snow storm, what was your approach to trekking out in the weather for the shows? Assuming money was no object, would you take your Ferrari out in a blizzard, or would you bust out the Range Rover? No brainer, right? Sure, I could throw on a pair of cordovan boots with dainite soles and a down puffer over-blazer to fight the elements, but would I really want to do that? Instead, I’ll probably just dig up the old, beat up Bean boots and grab a pair of heavy duty socks, some interesting sweatpants (everybody loves a pair of dope sweatpants these days) and a fur-lined parka. I was at Paris Fashion Week in the snow a few weeks ago and tried to stay tailored; this time, I showed up super cozy. Love the pattern on the scarf! Wow! Look at that face! Look at those clothes! Love his expression as much as his ensemble. He has a lovely chin. I really like that so elegant outfit and that scarf looks great, Now we have snow storm too and It is snowinbg and snowing, HAve a nice day. Happy,elegant but apparently missing somebody or something. wow,love the scarf and the coat! perfect mix! He looks so sharp, Love this outfit. It’s funny how people in Britain and certain areas of the US talk about snowy weather as a “snow storm” or “blizzard”. Just because it’s snowing it doesn’t mean that there’s a storm. And it is often reflected in not so clever clothing for the abovementioned weather conditions. The only way to go about it is layering with wool on the inside and fabrics that the snow won’t stick to on the outside. Sweat pants are just insane in snowy weather! Greetings from Norway with minus 8 degrees Celsius, snowflakes falling from the sky and not a storm in sight! I love the pattern of his scarf and his jacket!! Love the tailored and elegant look but strongly disagree about sweatpants. No one should ever consider sweatpants interesting or dope even with a designer logo across the rear. Very nice. Love the mix of patterns and textures. Not a fan of the avant garde, you can never go wrong with a look like this. I don’t see this being much good in the thirty inches we’ve just had in CT. Horses for course. He still looks pretty tailored to me!! Very handsome! It’s perfect. It’s too perfect. There is something a little contrived about the entire combination. I’m sure he’s a nice fellow, but I just prefer the shots of people featuring natural style. Fair Isle and tweed is a classic and successful combination. However, I agree with another comment that there is something contrived here; I suspect it’s the gloves in the breast pocket, too frequent a sight among fashion industry men and no longer strictly sprezzatura. A good fusion of colours, though. That is not a printed scarf. That is a beautiful Fair Isle knitted pattern–and it makes me want to break out the knitting needles RIGHT NOW. The only thing I find puzzling is that the classic Fair Isle technique of knitting–which is quite complex–usually involves creating a reverse side that is NOT presentable. i.e. a Fair Isle sweater or hat or whatever is not reversible. ?? “Interesting sweatpants”??? Give me a frigging break. You can be warm and comfortable and not look like that. Just ask millions of airline travelers who have that same philosophy. No, you can’t rationalize it. I think there’s a big difference between the sweatpants a lot of travelers choose to wear purely for comfort, and sweatpants that are just a little bit tailored, with a flattering fit, and a fabric that is both comfortable and beautiful. Nice sweat-pants? It’s just another push to buy a needless, over-priced, item when denim or wool trousers would do just as well. Perfect mix of patterns. Love it so much! 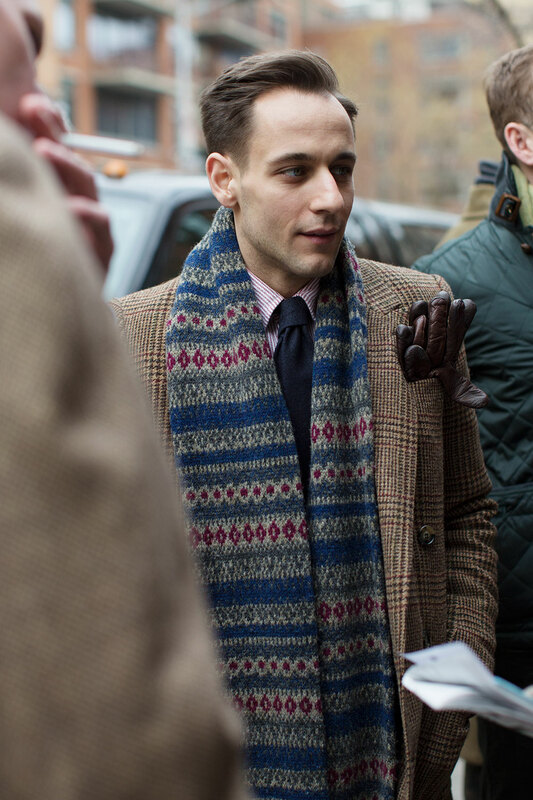 Very handsome, love the knitted pattern scarf on the jacket. Excellent job of pulling off this look! It seems effortless and not contrived. Brian Trunzo of Carson Street Clothiers. His now defunct website NTB was dedicated to ridiculing street style trends. Interesting to read some posts describing his look as contrived. What goes around comes around, I guess. For what its worth, I like the scarf. Drakes?